Aston Martin’s wildest-ever car – the track-only Aston Martin Vulcan – has been taken to breathtaking new extremes with a performance upgrade package developed by the luxury marque’s new performance brand, AMR. Making its public debut at the Goodwood Festival of Speed, the Aston Martin Vulcan AMR Pro sports extensive aerodynamic enhancements and shortened gearing to produce increased downforce, greater responsiveness and reduced lap times – improvements that underline its status as one of the world’s most extreme and exclusive track cars. Built in a strictly limited run of just 24 cars and delivered to customers throughout 2016, the 820BHP Aston Martin Vulcan was conceived and engineered to deliver the excitement and exceed the performance of Aston Martin’s Le Mans-winning race cars. Over the last two years, Aston Martin Vulcan owners have received step-by-step driver training by Aston Martin’s expert team of instructors – among them Aston Martin Racing works driver and three-time Le Mans winner, Darren Turner. The lucky customers have participated in exclusive driving events held at some of the world’s best Formula One circuits, including Circuit of the Americas in the USA, Spa-Francorchamps in Belgium, Yas Marina in Abu Dhabi and, naturally, Aston Martin’s home circuit, Silverstone. By enhancing its already prodigious capabilities the Aston Martin Vulcan AMR Pro offers customers the chance to further develop their driving skills and enjoy an even more intense driving experience. The Aston Martin Vulcan AMR Pro’s aerodynamic enhancements begin at the front-end with louvred panels added above the front wheel arches to extract high pressure air and reduce aerodynamic lift. A sizeable pair of dive planes have been added to each side of the nose to help pin the front-end to the track and the huge front splitter has turning vanes fitted to its underside to improve steering response. Weight has also been saved with optimisation of the carbon fibre lay-up and core form reducing the weight of the engine cover by 5kg. Changes to the rear are equally effective and even more dramatic, courtesy of a new rear wing. Now of dual plane design, rather than the original single plane item, the main element of this enormous rear wing features a 20mm ‘Gurney’ flap – a simple but hugely effective upstand on the wing’s trailing edge – which is supplemented by slotted wing endplates that sport additional 15mm Gurneys to maximise the amount of downforce. The combined effect of these aerodynamic changes is a major increase in downforce, from the standard Aston Martin Vulcan’s 3150Nm to a colossal 4000Nm. This compares to 3104Nm generated by the 2017 Le Mans winning Aston Martin Racing Vantage GTE. The aero changes have also improved the aerodynamic balance of the Aston Martin Vulcan, shifting its Centre of Pressure forwards bringing it closer to the middle of the car (47% compared with 41.5% for the standard Aston Martin Vulcan) to improve traction, steering response and front-end grip. 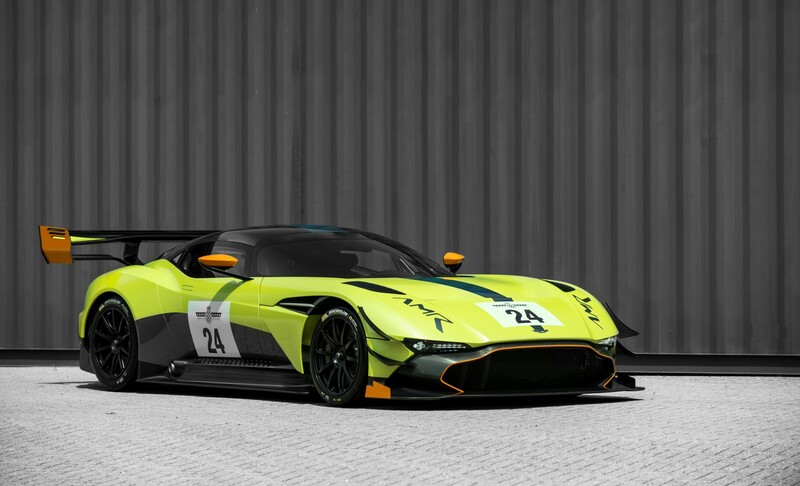 The Aston Martin Vulcan AMR Pro upgrade package will be installed by Q by Aston Martin Advanced Operations. Work is already underway on the first upgrades, with the first customer cars expected to be completed in the Autumn. The Aston Martin Vulcan AMR Pro will make its dynamic debut at the Goodwood Festival of Speed today.